This weekend was nuts! First I spent a lot of time recording interviews and preparing for the Round Table‘s OGL, SRD, DMs Guild, Strahd Spectacular. If you haven’t listened to it yet, check that podcast out. It’s the largest Round Table ever recorded, clocking in at just over two hours with ten guests commenting on the biggest fifth edition Dungeons and Dragons news since this iteration’s launch. When I wasn’t working on that, I spent my time turning my fifth edition archons and catastrophic dragons into PDFs for the DMs Guild. 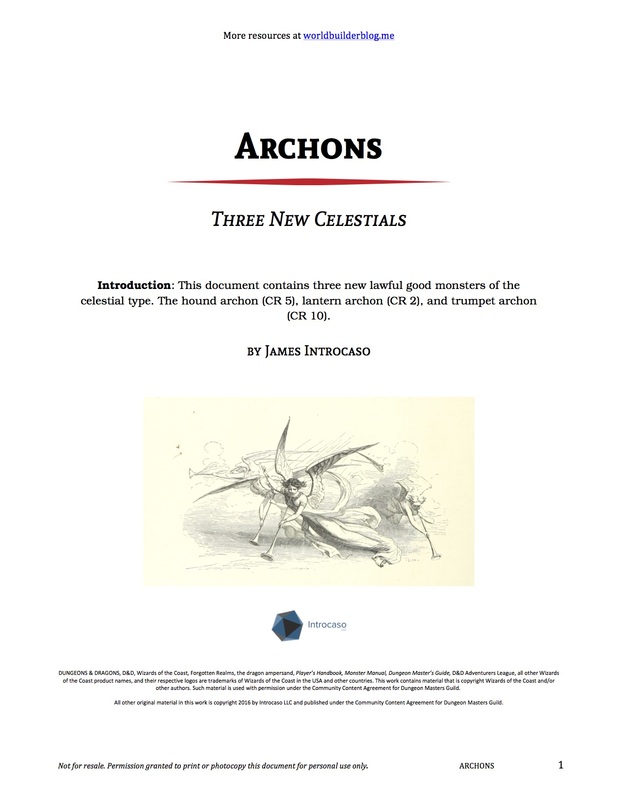 The Archons PDF provides the lantern, hound, and trumpet varieties of the titular creature while Catastrophic Dragons converts the blizzard, earthquake, tornado, typhoon, and volcanic dragons from fourth edition D&D at every age category. That’s 20 shiny stat blocks in one PDF! If you download the PDFs please leave a rating and/or review and let me know what you think. To be honest at the moment a rating is probably more valuable to me than paying for the PDF. As part of the terms of service, those monsters can no longer live on this site but I classified them as Pay What You Want PDFs. You can still grab them for free anytime. 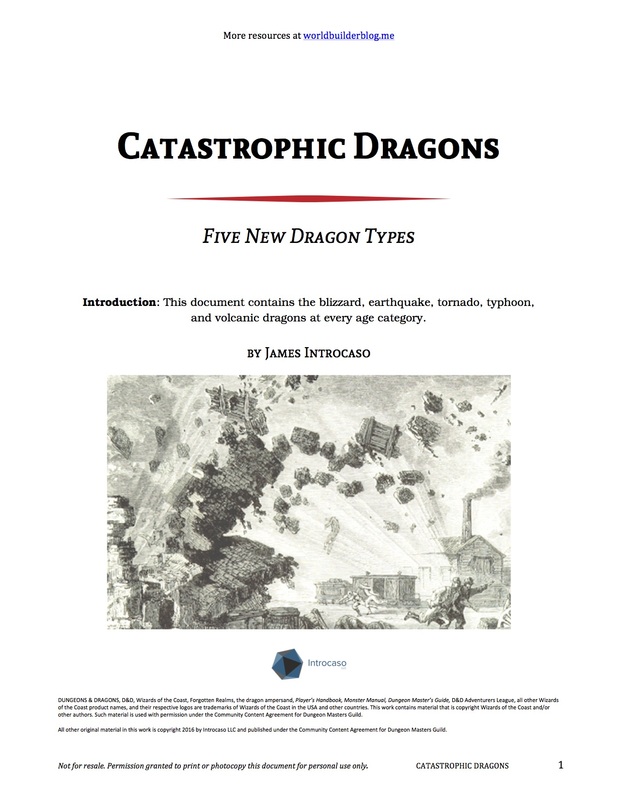 If you want to preview the story of those creatures before downloading, checkout their World Builder Blog entries: archon and catastrophic dragons. The PDFs are pretty nice and filled with DMs-Guild-provided and Public Domain art! It took me a long time to get the layout for these PDFs correct. Thank goodness yesterday was a holiday or they might not have posted by today. I was using Word (rookie move, I know) and so it was a learning experience. I have plans for one more PDF going up on the DMs Guild by Thursday and then it’s back to the races of creating the Exploration Age campaign guide and providing DM tips. If you’re looking for the products I post on the DMs Guild, there’s a few ways to find me. First I’ll put “World Builder Blog,” in all of the titles so you can search for that. Second you can find one of my products and then click my name at right under “Author” under “Product Information” to get a master list of my products. Finally to keep things simple, I will link any PDFs I post on the DMs Guild to the Free Game Resources section of this site. That’s it for todays update. I know it’s short, but laying out and editing those PDFs and preparing the massive podcast took pretty much all my free time. Thanks so much and please check out the PDFs.